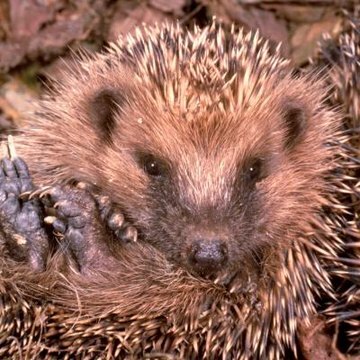 Despite the resemblance, the hedgehog isn't related to the porcupine, and he's much cuter than his closest relatives, shrews and moles. Despite the hedgehog's spiky appearance, this little fellow has an appealing look, perhaps because he's small and stout. He has a short tail, easily overlooked because of his quills. You'll only come across a hedgehog in captivity in the U.S. because his native home is outside of the Americas, in Europe, Asia and Africa. In addition to a short tail, he has a nose perched on a long snout and prominently placed ears -- this guy is put together to have a keen sense of smell and good hearing. His small legs are powerful and sport curved claws, adding up to make him a great digger. Of course, since he's known as a pincushion on legs, you can't overlook the hedgehog's quills, the dense spines made of keratin covering his back. His belly, face and neck are covered in coarse fur, which varies in color to white to light brown to black. His quills have bands of color, giving him an eye-catching appearance. Those quills do more than help him look good; if threatened, the hedgehog rolls himself into a ball to point his quills outward and protect his vulnerable belly. Does a Hedgehog Have Good Hearing & Eyesight?